For just INR 200, this new fish pedicure spa will relax you and is the perfect recipe for happy feet! Sit, soak your feet into a pool of water, and scroll down your Instagram feed while hundreds of tiny fish nibble at your toes. People are rounding up at It's Fishy, a new fish pedicure spa on the ground floor at Spencer Plaza to get back on their feet; literally. Soak your feet and your troubles for 20 minutes at INR 200. The Garra Rufa fish, a Turkish breed, popularly known as the ‘nibble fish’ and ‘doctor fish’ exfoliates skin and improves blood flow. In those 20 minutes of your soak, the fish nibble away your dead skin and stimulate acupuncture points so when you get out, your feet feel softer and happier! The temperature of the water is warm and is filtered in five stages and cleaned everyday, so you don’t have to worry about hygiene. 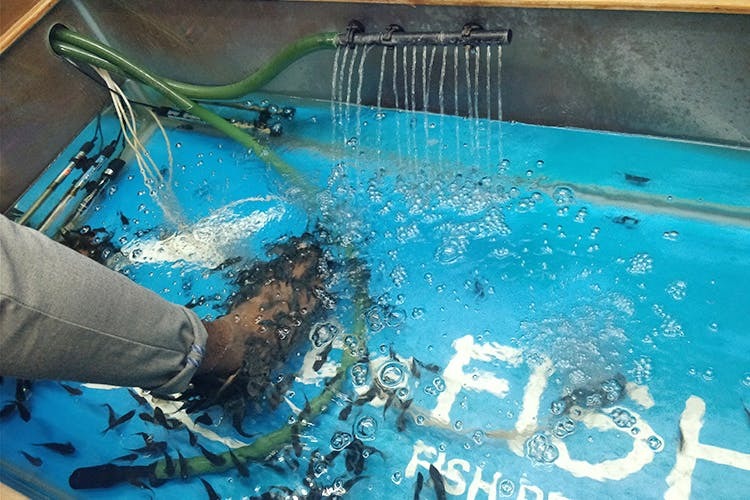 So, head down to Spencer Plaza and get your pedicure from doctor fish!